Leylandii is the best option if you want a hedge in minimal time, as they are the fastest growing of all the hedging plants available. It is a tricky one though. It needs to be cared for and not allowed to get too big. For a manicured hedge like this one, they need trimming at least twice a year. Often, if they are allowed to get out of control, it’s hard to get them back looking like this, and they can be damaging to the lawn too. If you are going to have Leylandii on your grounds, you must also be aware that there is a law which prevents you from blocking your neighbours light with a large hedge. Find out more here. 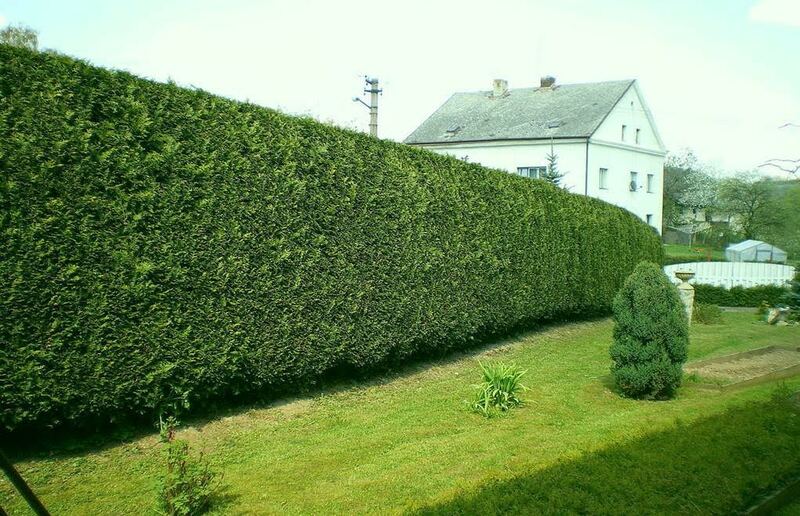 It is known to have been the cause of many neighbour disputes over the years, but, if kept trimmed it does make an excellent evergreen hedge. · Thuja Plicata (western red cedar) –Another conifer which is ideal if you want a fast growing hedge. Similar toLeylandii they will grow around 2-3ft a year, but are less evasive and so a good alternative. They also grow from old wood so do recover better from a hard pruning should the hedge be neglected for a few years. · Common Laurel (Prunus rounderfolia)– An excellent evergreen shrub that is ideal for forming dense hedges of any height. It grows fast and will easily grow approximately 2ft (60cm) a year. Unlike Leylandii it will respond well to hard pruning as it does shoot from old wood. · Hawthorn (Crataegus monogyna) – Also known as ‘quickthorn’, it is a deciduous shrub that is ideal for hedging and is often seen growing around farmers fields to form boundaries. It is best to cut them by around half which will encourage the plants to bush out in spring and form a denser hedge quicker. Hawthorn will make a good hedge of over 10ft(300cm) and will grow into a small tree if left untrimmed.